Head scientist from the Cern particle physics laboratory told the BBC he expects to see first glimpse of the Higgs boson by next week. 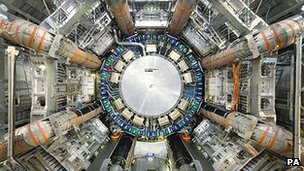 The finding of the mysterious fundamental particle will be a significant milestone at the Large Hadron Collider (LHC), that was built with the hunt for the Higgs boson as a key goal. The Higgs, notoriously difficult to define, helps us to understand why particles have mass. The search for the Higgs has become the hottest pursuit in modern physics. It is separate from the unexpected announcement in September of the apparently faster-than-light neutrinos, a result which is still puzzling the world of physics, and has taken the limelight recently. Next Tuesday, two separate teams will each reveal the outcome of trawling through their latest data from LHC collisions. A spokesman for one of these teams told us that this year alone they’ve searched the remains of some 350 trillion collisions, with only ten or so producing candidates for a reliable sign of the Higgs. The two teams of scientists work independently, using two separate detectors – called ATLAS and CMS – each relying on different technologies. This way they provide an independent cross-check for each other. How closely their results agree will be an important measure of how significant a finding they can claim. The teams have been focussing-in on the Higgs by ruling out energy ranges where it might be lurking. They now expect to see it at around 120 to 125 GeV (gigelectronvolts), where one GeV is about the mass of a proton. Professor John Ellis, a former head of theoretical physics at Cern, told Newsnight’s science editor Susan Watts about the growing sense of excitement at Cern, a week ahead of that key science meeting next Tuesday. “I think we are going to get the first glimpse. The LHC experiments have already looked high and low for this missing piece. It could be that it weighs several hundred times the proton mass, but that seems very unlikely, then there’s a whole intermediate range where we know it cannot be, then there’s the low mass range where we actually expect it might be. There seem to be some hints emerging there… and that’s what we’re going to learn on Tuesday”. Professor Ellis, who is now a guest professor at Cern, and was recently made James Clerk Maxwell professor at King’s College, London, told Newsnight that finding the Higgs matters hugely to modern physics. “What we have at the moment is something we call the Standard Model, that describes all fundamental particle physics. You can think of it as being an enormous giant Jigsaw puzzle, but there’s a piece missing right in the middle there. We have been looking for this for 30 years now, and finally, maybe, hidden under the back of the LHC sofa…we are finally finding it”. The teams at Cern will not claim next week’s result as an official “discovery” – a so-called 5-sigma event. This is because they have not yet produced enough experimental data to make that claim. That will come next year, probably by the summer. Journalists are being told to wait for the briefing after next week’s scientific meeting, but researchers whom Susan Watts spoke to in the coffee shops of Cern were finding it hard to keep the smiles from their faces. Understandably perhaps, the director of research at Cern, Sergio Bertolucci, is being more cautious than Professor Ellis. He told me, somewhat enigmatically: “It’s too early to say…I think we may get indications that are not consistent with its non-existence.” He expects next Tuesday’s results to amount to less than the formal definition of “evidence”, but said the statistics will be “very interesting”.